How did I change my ways? And what can you learn from my journey to overcome your struggles? While I wouldn’t agree that vice is necessary for virtue, there’s something about this quote that rings true. I have known vice well. But for a long time in my life, virtue didn’t follow. For almost a decade, I was lazy and unproductive. I spent nearly 12 years as a weekend binge-drinker and partier. Worst of all, I used to be a jerk. I had the seven deadly sins covered—and then some. “If a man were called to [define] the period in the history of the world during which the condition of the human race was most happy and prosperous, he would, without hesitation, name that which elapsed during the time of Marcus Aurelius’ reign,” wrote Edward Gibbons in “The Decline and Fall of the Roman Empire.” It was a time, Gibbons claimed, when the vast Roman Empire was governed with virtue and wisdom. During its prosperity, the great wisdom of the Stoics deeply influenced the leaders of the Roman Empire. Their sage philosophers brought a semblance of peace through reason and self-awareness to the Romans. 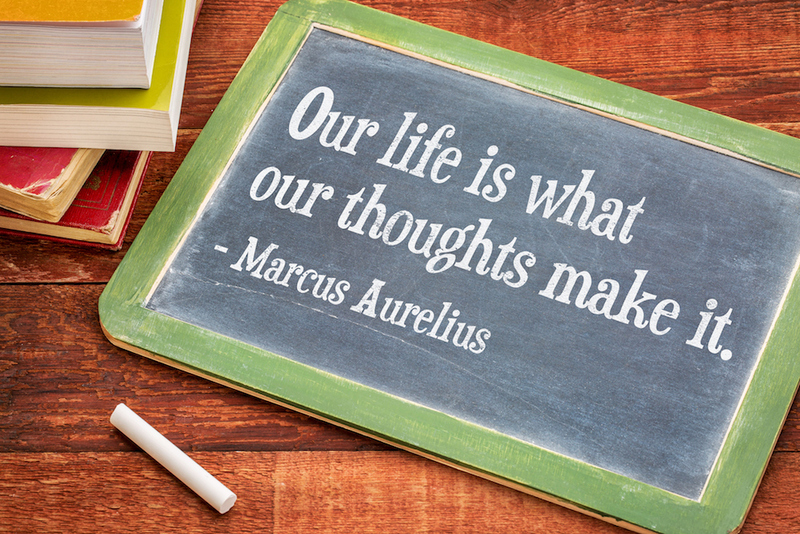 Little surprise, then, that young Roman citizen Marcus Aurelius took to Stoicism with gusto. But no one, not even Marcus Aurelius, is perfect. Thankfully, however, the Stoics taught him how to manage failure, too. When he erred, he recognized his missteps as opportunities to learn and improve—as should you. “Everything that happens, happens as it should, and if you observe carefully, you will find this to be so,” Aurelius wrote. We all fall off track. That’s okay. Our struggles make us stronger. Not quitting is what separates the winners from the losers. I’m living proof that if you never give up on what is important to you, then you can overcome a great many vices and become successful. The Stoics—and Aurelius—knew this well. But they also knew that prosperity requires action and self-awareness. If you live these virtues, you’ll know happiness. So I urge you to use the three steps below, inspired by the wisdom from Marcus Aurelius and the iconic Stoics, to persist and improve, changing your ways as I did many years ago. When I started posting my rules, my goals, and my struggles online it gave me massive public accountability to the world and to my clients. I could NOT disappoint you, or you’d see me as a hypocrite. This accountability made me get up early and do my work, create a seven-figure fitness business, and forced me to step outside of my comfort zone every day. In addition, I hired coaches and recruited my best friends (Bedros Keuilian, Matt Smith, and Joel Marion) as “big brother accountability.” They are men that I did not—and still do not—want to disappoint. If I do, they will give me the “look of death,” and nothing makes me feel worse! Like great coaches, they hold me to a higher standard and make me play up a level. Your action step: Get accountability from someone that you deeply do not want to disappoint—AND make sure there are consequences for not following through on your commitments. All of the planning, advice, and information in the world is useless without action. We know what to do, we know where to start, and we know the resistance we face. It’s all there in plain sight, and it demands that we overcome the inertia of the moment. …do something about it right now. This article will still be here for you when you come back. Go. Now! Do something. Make a call. Finish a workout. Write a headline. Record a podcast. And I’m still here. Told you I would be. Action beats anxiety. Motion beats meditation. Implement every day, preferably first thing in morning. Your action step: Put a plan in place right now to build better habits, to get out of your comfort zone, and to do the necessary work to grow personally and professionally. Bedros Keuilian, my coach, friend, and business partner, said that one of the best things about me is that I’m the most consistent and reliable person he knows. I was a little surprised to hear that. I thought that everyone showed up on time, did what they said they were going to do, and worked hard every day. Perhaps I’m just a naïve farm boy. I learned the virtue of consistency from my father. Every morning, whether it was in the bitter cold of January or the unshakeable humidity of July, he fed his cattle at 6:30 a.m. and 5 p.m. sharp. Cows don’t take a day off from eating, and you can’t take a day off from what fuels you—becoming the best person you can be. So take action—and do it consistently. This deep work is how you improve your entire self, while mastering your life. Remember: Small steps, performed repeatedly, will take you up the tallest mountains. It just takes time. If you’re struggling, you’re human. But you must remember that you don’t get better going backwards. You don’t overcome obstacles by giving up. You get out of the funk one step at a time. It’s never too early to start getting better. And it’s never too late to fix the problem. Action step: Lay down your vices, take up your virtues, and change your ways. It’s made all the difference for me, and will for you too. Just this last year, I spent an amazing weekend with inspiring folks of all backgrounds at my Perfect Life Retreat. 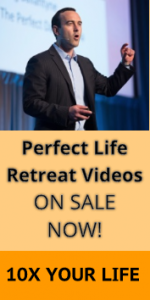 If you couldn’t make it, I hope you’ll consider it for next year (keep an eye out for information as November 2018 nears), but for now, take this step toward your biggest goal: Download my Perfect Life Retreat videos. I’ve already been hearing stories about how impactful these videos are. If you want the push you need to take action and make 2018 your year, then I urge you to take advantage of this video program today.